You Have to be Rich or Retired to RV Full Time, Right? Wrong. When we tell people that we are living in an RV and travel full time. The common response is “I wish I could do that, but…” followed by some reason they can’t. I usually respond with “You know, almost everyone can do this and it’s not as expensive as yout think.” You don’t have to be successfully retired or a trust fund baby either. You just need to be willing to think differently. I also hear people that are looking to begin this lifestyle saving for years and when they finally get here they wish they had done it sooner. You can be any adult age and live this life Right Now! The short of it. Know your expenses, know your limits on RV spending, find work that can pay your bills. Of course, it is always easier if you don’t have any debt and you have some type of savings. We don’t have a great portfolio: minimal savings and we have some debt in the form of vehicles and a time share. 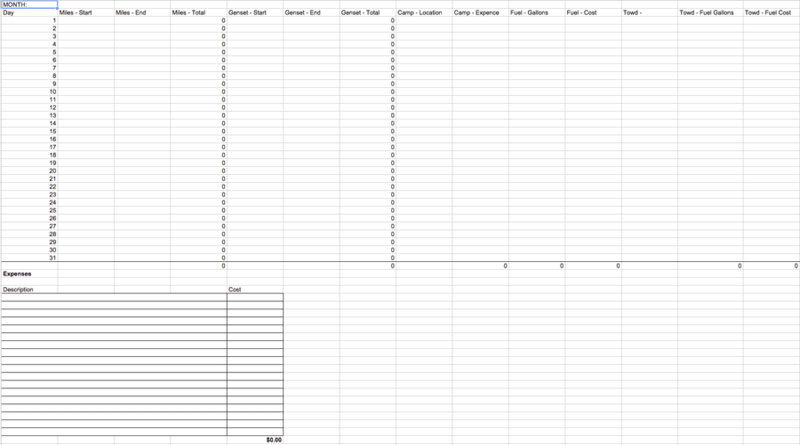 If you look at the table below we have broke down all of our regular expenses after moving into the RV. As you can see we have a few items that we should work on paying off as soon as possible: Time Share Mortgage, Jeep Payments and RV Payments. The first two being the majors. This would save us $680.19 or $1666.92 a month. So we should take some of the savings, yes I said savings, we had from moving out of our apartment (approx: $663/month) and put it into paying down these other payments assuming we make the same amount of money we did living in the brick and mortar. You might be wondering where the savings came from? “Rent” dropped from $1350/month to $1085 (RV + Ins): $265/month saved. We got rid of an extra car: $333 + ins for $398/month saved. We also have a savings not reflected the previous numbers $650/month saved in gas to and from work, jobs or fun, even with gas at $3ish/gallon (which we could put towards RV gas or Jeeping gas). UPDATE Sept 2017: We have gotten rid of the Timeshare as well as the Jeep Payments. We have had an increase in the cell phone bill due to adding another line to $336. The storage fee has gone up to $235. We have combined the jeep and RV insurance and added renters insurance to to cover any losses of items in the vehicles for $155. For a total of 1712.73. Yay for us! For a fun little exercise, find out how much of your day you spend paying yourself to show up for work everyday. Gas + Lunch + (hours to and from work * hourly pay). Then ask yourself is it worth it? 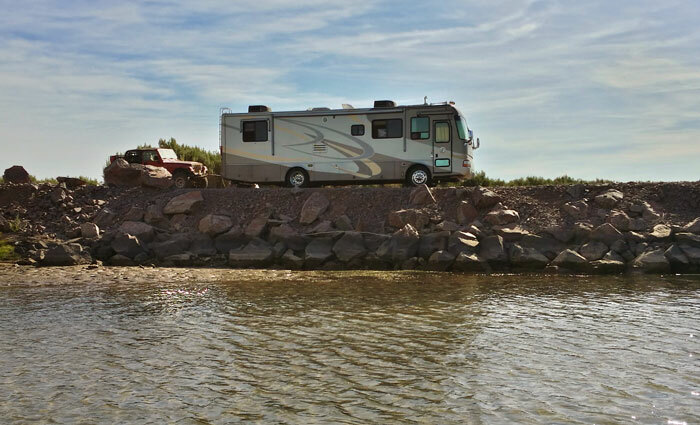 RV expenses come in the form of gas, propane and campground expenses. The nice thing about this lifestyle is all these are mostly optional. How is that? You can limit the distances or frequency you travel to minimize fuel costs. We didn’t paid for camping from May 2014 through December 2014 by staying at friends and boondocking. Work camping, which we will cover later, usually provides a camp location with no expenses. Propane can be conserved by using it only for the fridge as needed or not at all if you have power hookups. 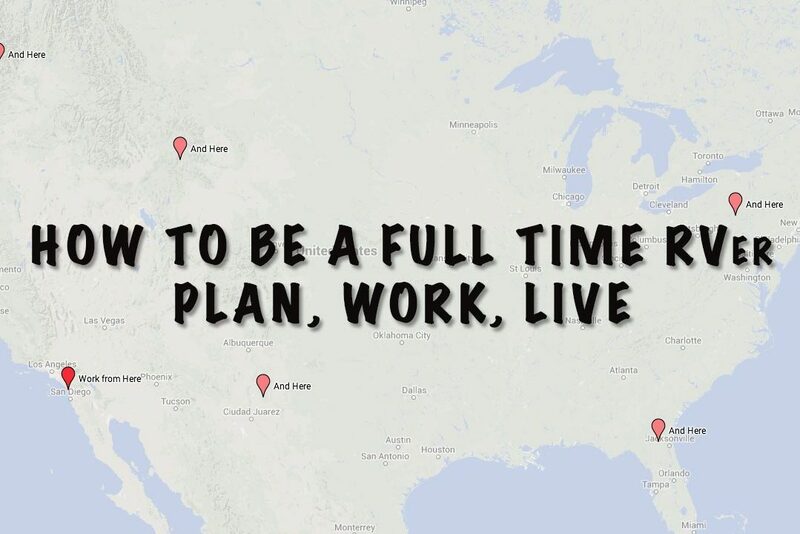 What Kind of Work Can You Do While Traveling Full Time? There are actually a lot of jobs you can perform while traveling. The Internet is probably the biggest enabler of location independent work opportunities, but there are other options as well. Let’s take a look at some of them. Most people hear work camping and think camp hosts, this is only one of the many options for work campers. Most national parks have shops, services, and campgrounds all of which need people to run them. So you can find work as a cashier, office worker, custodian, janitors, mechanics, and many more I can’t think of right now. I would consider these jobs the least mobile, because they require some time commitment in one place, but they usually come with full accommodations. http://www.workamper.com/ is a great resource for finding jobs or researching this option ( small fee required ), http://backdoorjobs.com is another resource not dedicated to RVers but offers some interesting options for outdoorzy people, http://www.coolworks.com/jobs-with-rv-spaces/ is another site that has some healthy alternatives dedicated to RVers. If you search for work campingonline you will find many more. Some industries allow workers to telecommute to work at all hours of the day. You could also lump in freelancing into this category since it is technically contract based telecommuting. You would be very surprised at the number of opportunities that lay in this area. If you are looking for this type of work be very cautious about the sites you use. There are many “work from home” scams out there. http://www.careerbuilder.com/jobs/keyword/telecommute CareerBuilder is a major job board site and they have a bunch of listings, http://www.indeed.com/q-Telecommuting-jobs.html another major job board with a bunch of listings, https://www.flexjobs.com/ All types of telecommuting jobs, some you wouldn’t think possible (small fee required), https://www.elance.com/ this is a big freelancing site that allows you to find and bid on freelance work of all kinds of jobs. I tend to stay away from the bid type sites since they rarely pay US expected wages. We have included them for completeness. This is where many people tend to dabble in, by means of a website/blog or some type of storefront, in the full time community. This is also the area in which we fall, we have our own businesses, all of which are location independent and not by chance. There is a quote that I am firm believer in is “The only way to get a job, is to create a job.” by a man by the name of Carl Olsen. You should definitely examine your options in this category. I believe that everyone has a skill or idea that others would benefit from. YouTube has many excellent examples of this, teach someone something or talk about something you are passionate about. If you have any writing skills you can do a website and blogs on anything you want, not just travel or RV life. One of my favorite resources for online business is http://www.smartpassiveincome.com/, Pat is a genuinely nice guy and it has a bunch of information about niche website building and general online business marketing and ideas. Don’t limit your mindset either, there are many businesses that can be run location independently, for example a phone app, consultation, software development, art, book keeping, finance, telemarketing, marketing, and on and on. We have a few businesses, some in startup mode and others at full force. I, Corey, have been editing for a group of commercial photographers as a contractor for about 7 years in an office that was not my own. I bought my own equipment and took that business mobile. This is our number one income source right now. I have been in the IT realm for about 20 years now, working as technical support for web companies, networking, web development, etc. I always educate myself in online markets. I took this and started doing marketing for different companies which I find to be extremely fun and challenging. This has become another business for me, and our second highest income stream. Jen has worked as a waitress, loan processor, debt collector, debt manager and most recently a corporate recruiter. She was laid off from her job as a corporate recruiter for a major construction company. Now she works as a corporate recruiting consultant in her own business finding candidates for companies and helping them improve their human resource processes for hiring. That is income source number three. She is also working on a debt management project to help people become debt free. Soon to be a great passive income stream. We are also going to be monetizing certain aspects of this website with affiliate links like Amazon and others to help pay for some of the time we spend making quality content. Check out some of the sites in this article. Do some research. Map out your expenses, figure out how much you really need to make. See where you can cut your monthly bills and debt. Decide what your comfortable with. If you don’t have an RV go look at what’s out there, see what you can get for what you’re willing to spend. Rent an RV if you still aren’t sure, play house. This lifestyle is very accessible to every age group now. We love the independance of it. We hope we can inspire you to stop “wishing you could” and start “living the dream”.